As regular readers know, my Mu-Pan hexcrawl is based on Mike Davison’s excellent Ruins and Ronin ruleset (and by reading this sentence, you are now contractually obligated to go buy it – sorry, the law’s the law). R-n-R is, in turn, based on Swords and Wizardry White Box, so it keeps things simple. There are four classes – Bujin (fighting-man), Sohei (cleric), Shugenja (magic-user) and Half-Ogre. In addition, Mike has released the Ninja, Kensai, Headhunter and Henyeyokai classes on his blog. The bujin is, essentially, a samurai that can make use of the heaviest armor in the game and any weapon. Unfortunately, Mu-Pan is based as much on China as Japan, and that leaves a few gaps where fighting-men are concerned, primarily in the form of the shaolin monk. Of course, there’s a perfectly good monk in NOD 1 and S-n-W Complete, but I decided I wanted to minimize reliance on other rulebooks when writing Mu-Pan. Besides which, there are some important differences in terms of Hit Dice between White Box, Core and Complete. To that end, I came up with this little system for modifying the existing bujin to model different kinds of Asian warriors, from wandering swordsmen to fighting monks to members of dart bureaus. Keep in mind, this is a rough draft. I’d love to hear comments on the concept. The bujin as written is designed to be a heavily armored warrior, serving on the front lines of an adventuring band, his o-yoroi armor deflecting deadly blows while his flashing katanas cut down foe after foe. 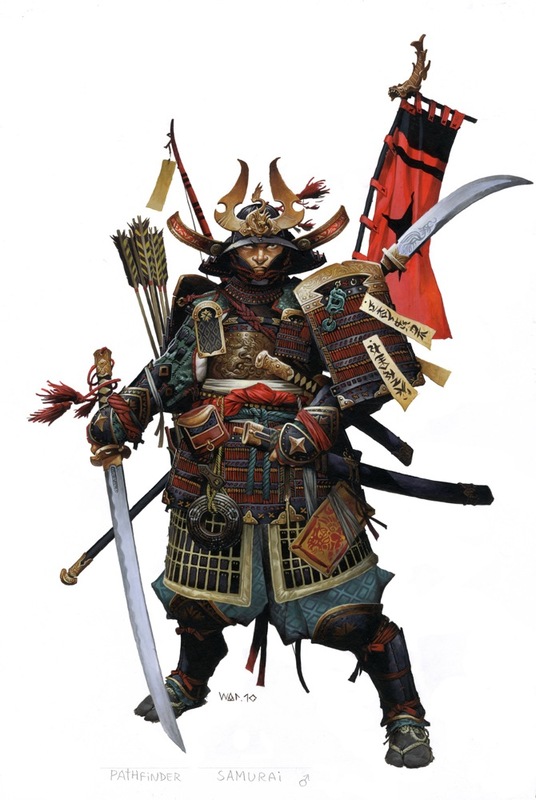 This is a fine archetype of Asian fighting prowess, but it stands at almost the opposite end of the spectrum from Asia’s other great fighting archetype – the unarmed martial artist. To model your bujin as something other than a samurai, this houserule permits you to reduce your allowable armor in return for a special ability. The less armor you are permitted (and thus the more damage you’re likely to take in combat), the more special abilities you can have. Combat Sense – You are normally surprised on a roll of 1 on 1d8 and can make a saving throw to avoid back stabs from ninjas and thieves. Estimate Foe – For each round you do not attack your opponent, you gain a +1 bonus to hit, Armor Class and damage for the remainder of the combat against that opponent. Iron Hold – With a successful attack you wrap your opponent up using your arms and even legs; equivalent of a hold person spell until your opponent makes a successful saving throw (penalty equal to difference between your strength and their strength). If your attack fails, you suffer a 1 point penalty to Armor Class until your next turn. Mounted Archery – You suffer no penalties to firing a bow from an unsteady platform, like a boat, horse, flying carpet, etc. Swift Motion – You roll a separate initiative from your group, and may take whichever initiative roll is better. Your movement rate is also increased by three. Image by Wayne Reynolds via Paizo. I’m a WAR junkie, so when I saw this image pop up today on their blog, I had to appropriate it.